Secret Charles-Ford, Ed.D, graduated from the School of Educational Leadership & Change at Fielding Graduate University (2014). Dr. Charles-Ford earned two master degrees while attending Antioch University, Seattle. Her first graduate degree was earned in the Environment & Community program (2004) with a second graduate degree earned in Education (2007). 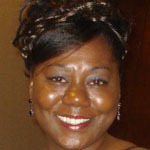 Dr. Charles-Ford earned her undergraduate degree through the Department of Geography at the University of Washington. She served on the Sacramento, California Environmental Commission (SEC) from 2014 to 2015. The SEC was created by the Sacramento County Board of Supervisors and Sacramento City Council in 1988 with a broad charter to provide information, analysis, and advice to the elected officials on environmental issues, and to provide assistance and advice to the Environmental Management Department on environmental programs. In 2012, Dr. Charles-Ford published her first book titled Vietnam, PTSD, and Therapy: Survived All That!. It is a book about one person’s account and experience as a military personal and a combat veteran. Vietnam, PTSD, and Therapy: Survived All That! is available for purchase at Amazon.com.